The Atlantic Ten Championship Tournament Kicked off on Wednesday and continued to Thursday before the number four seeded Saint Bonaventure Bonnies saw the hardwood for a battle. The fans all around one of the smaller conferences knew they were in for a good one. This game was being donned the marquee matchup of the day on Friday. This was a battle between two good teams who play two different styles of hoops. The Bonnies are a very defensive team but, George Mason is a very offense-oriented team. This one was a game of runs especially in the opening portion of the quarterfinal bout. 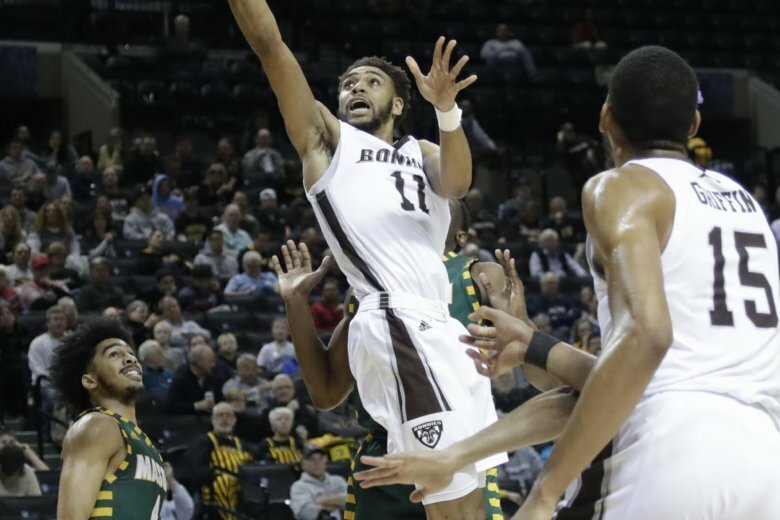 Even more than that, the young guns were the reason the Bonnies of Saint Bonaventure led Otis Livingston and Justin Kier of GMU. Why do I say the young guns were the difference makers? Two of the Bona starters on Friday were almost in double figures and their boss, twelve-year coach Mark Schmidt. There were number one newcomer Dominik Welch and the man who displays the zero nerves, Kyle Lofton. They both had nine tallies. That changed very fast as Welch drilled a nasty three-point basket to start the action again for the second half. Osu Osunniyi dominated the boards again as he had six boards at around the thirteen minute mark. Then, shortly thereafter, the hotshot of the game Welch put three more on the board to be at 15. He followed with two more. Less than halfway through Kier led all three major categories for GMU with 20 points, six rebounds, plus two steals., but the Bonnies bought the defensive heat with a ton of blocks on the contest. Welch and Lofton scored a combined 40 of a total 68 points for the brown and white Bonnies. Ladarien Griffin picks up a double-double with 10 points and an impressive 11 rebounds. Courtney Stockard had six points and Osu Osunniyi accounted for seven. The Bonnies have to play the #8 Rams of Rhode Island after RI stunned VCU. That game will take place today at Barclays Center.